Nestled in downtown Mount Clemens, O’Halloran’s Public House and Hall is a contemporary version of a traditional European style Public House. With its warm and inviting ambiance, our public house is sure to be the perfect gathering place for the downtown residents and beyond. The guests of O’Halloran’s will find themselves surrounded by dark wood grains, decorative mill work, warm lighting and timeless décor, all showcasing a beautifully ornate bar. With indoor and outdoor seating along with an adjoining reception hall. O’Halloran’s is the ideal spot for a quick bite, an evening of conversation or a private get together, large or small. Complimenting the space itself, O’Halloran’s Public House provides high quality gastropub food and beverages for our restaurant and private, catered events. By putting a new twist on the traditional European favorites to the classic sandwich, there will be something on the menu for everyone to enjoy. 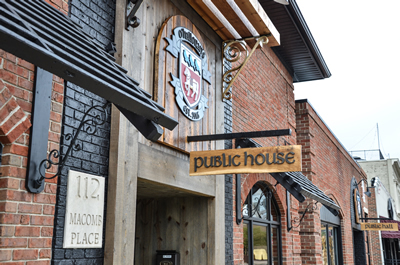 Paired with an extensive selection of craft beers, specialty cocktails and wine, a visit to the public house will keep not only the O’Halloran’s patrons bellies full but their merriment and spirit as well. To ensure the highest quality experience, the owners and management of O’Halloran’s Public House will be intimately engaged with the guests and business day-to-day. It is our mission to keep up the high standard that is prevalent in our other establishment, Orleans Sports Cafe located a short walk from each other on Macomb Place in downtown Mount Clemens. The rich atmosphere coupled with exceptional service and moderate pricing will guarantee that O’Halloran’s Public House will be a downtown mainstay for years to come.